How to make the most of each day? We find it all spelled out in Psalm 37. Welcome back to this series. Part 1 and Part 2. Commit your way to God. Ever thought through what it means to commit your way to God? In reality, this is our life journey, and it includes our direction, manner, course of life, and moral character. Needless to say, our way covers a lot of personal territory. Are you a morning person or a night owl? Is your personality extroverted or introverted, or somewhere in between? Are you a list maker or a “go where the wind takes me” kind of person? Do you struggle to curb your tongue, complete tasks, or keep your house clean? Have you committed these things to God? Whether your journey has been smooth or filled with bumps in the road and unexpected turns, commit your way to the Lord. Trust Him with the whole journey. Right in the middle of who we are and what we are doing, this is where God wants to be.<Tweet this. Roll your cares, questions, and concerns onto Him. Place in His capable hands your hopes and dreams, the desires of your heart. Make the most of each day this year as you commit your way to the Lord. Have you ever tried to go two directions at once? It isn’t possible–believe me, I’ve tried. You can’t go left and right at the same time, and you can’t live for yourself and for God at the same time. Eventually we get caught in the tension of trying to live for self and for God, and this is an exhausting, miserable place to be. I have spent too many days trying to hang on to self and hang onto God. Later, James writes about the instability of being a double-minded man who is driven and tossed by the winds of life. There is an uncomfortable stress that takes up residence in our hearts when we try to live a divided life–part for God and a lot for self. Anxiety and confusion also result when we only partially trust God, living on the part-way plan. “Lean on, trust in, and be confident in the Lord with all your heart and mind and do not rely on your own insight or understanding. In all your ways know, recognize, and acknowledge Him, and He will direct and make straight and plain your paths” (Proverbs 3:5-6 AMP). Go all in. Don’t hold back. 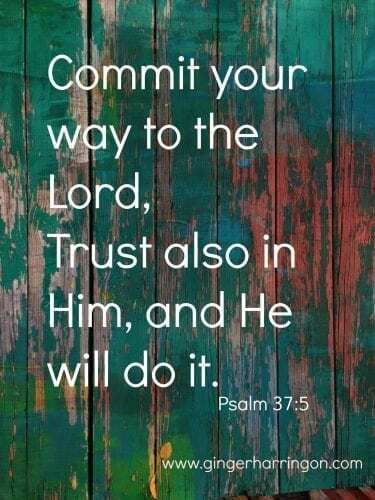 Commit your way to the Lord and trust Him with the results. The burden of proof is on Him. Which area of life do you find the greatest challenge to commit to God? Use the social media buttons to share this post. Goals, habits, Proverbs, Psalm 37, Seeking God, SPIRITUAL GROWTH, Trusting God. Bookmark. Remembering to Let God Bring out the Best in you this Year. I read this series all in one sitting. God blessed me as He brought all these truths together. 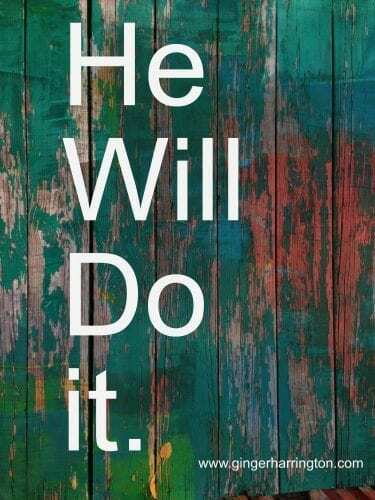 You’re right, if we’re in His will, He will do it. When my girls were ready for college, we could get a big discount at Okla Univ because both of us went there. As we prayed, we knew that wasn’t the place for either of them. After they chose their colleges, I told them, “It’s our job to be obedient, it’s His job to pay for it.” He was faithful to do just that! What a great example of God bringing it! Sometimes we get discouraged and forget that God is more than able to Bring it. Thanks for sharing a real time example.